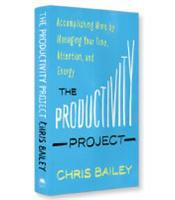 When Chris Bailey, author of The Productivity Project, graduated from college, he declined two lucrative job offers. Bailey didn’t want a job because he wanted to focus full time on his passion ever since reading David Allen’s classic book, Getting It Done, in high school: productivity. He launched a blog, A Year of Productivity (AYOP), and began researching productivity — reading books, interviewing experts and conducting experiments of every kind. In one experiment, he alternated between 90-hour work weeks and 20-hour work weeks — not the kind of endeavor that is possible when you’re working in an office for a boss. For one three-month experiment, the normally late riser woke up instead at 5:30 a.m. Another three-month experiment involved using his smartphone a maximum of one hour a day. Every day, Bailey blogged about what he had learned from his experiments and research, writing a total of 216,000 words about productivity by the end of the year. The Productivity Project: Accomplishing More by Managing Your Time, Attention and Energy is the culmination of Bailey’s daring year of experiments and research. 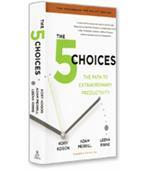 Two keys to leading productive lives are found in the subtitle of the book. First, the ultimate measurement of productivity is whether you’ve accomplished what you set out to accomplish that day. Number of hours or number of words written or any other statistical metric is irrelevant: You can be busy and not productive. The second key to productivity is understanding that productivity is not about managing time but, rather, about managing time, attention and energy. All three are equal components of productivity, and in fact, managing time should be the third priority. For example, Bailey found, to his surprise, that he accomplished only slightly more during a 90-hour work week than he did during a 20-hour work week. 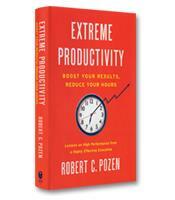 The 20-hour work week forced him to expend more energy and attention (focus) on the tasks at hand, thus causing him to be significantly more productive. This leads to the counterintuitive lesson that for important tasks, it is better to spend less time in order to increase energy and focus, create a sense of urgency and limit procrastination. As in any book on productivity, procrastination is an important subject. Conquering procrastination, Bailey explains, requires deliberately reversing, or “flipping,” its six triggers, specifically work or tasks that are boring, frustrating, difficult, unstructured or ambiguous, lacking in personal meaning and/or lacking in intrinsic rewards (i.e., they’re not fun or engaging). For example, if you are procrastinating on doing your taxes, make the task less boring by doing them on a Saturday afternoon at your favorite café while people-watching. Bailey also discusses the importance of managing your Biological Prime Time (BPT), the time or times of the day during which you have the most energy — and when you should be doing your most important work. Perhaps one of the most important lessons of the book comes at the beginning. To be productive, Bailey writes, “you have to deeply care about why you want to be productive.” If you don’t care deep down about what you are trying to accomplish, not even the great techniques and insights in The Productivity Project will help.